On April 4th The Valerie Fund Center at Goryeb Children's Hospital in Morristown held a celebration for the children, families, educators and donors who have participated in the VGo program. Now in its second year, the program has been enthusiastically received from the beginning. 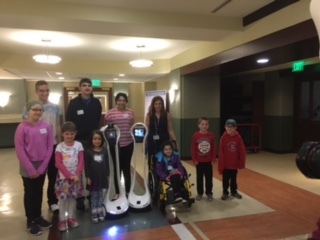 After meeting her first VGo robot, Educational Liaison Joann Spera recognized its great potential to act as a "technological liaison" and offer a unique opportunity for Valerie Fund patients at home to successfully continue their studies and relationships with teachers and friends. With the support of The Daniel Galorenzo Foundation, the VGo made its debut in a Chester, New Jersey classroom becoming the eyes and ears of an 8th grader named Sebastian being treated for Hodgkin's lymphoma. Sebastian was controlling the VGo from a laptop at his kitchen table and his face was live on a screen that his teacher and friends could see while he saw them live on his computer. According to Spera, "For some students, attending school just isn't possible. Injuries, extended illnesses, immune deficiencies and other physical challenges prevent a student from physically being able to attend school. School districts try to accommodate these special needs by providing on-line courses, in-home tutors, special busing, videoconferencing and more." These options, are limiting since students-particularly in middle school and high school-miss out on the classroom experience and social life that comes with attending school." In the past 15 months, close to 20 Valerie Fund patients, thanks to their VGo robots, have participated in interactive classroom discussions, school assembles and after-school activities. They have been able to share in the banter during lunch period and at their lockers and during exchanges between classes. The VGo celebration brought together students and their parents, teachers, benefactors and The Valerie Fund Children's Center staff to share heartwarming stories about their experiences with this special friend. Donors walked away with a better understanding of the significant impact their generosity has made and will continue to make on kids for years to come. Katrina, a ten-year old Valerie Fund patient who is currently in the 5th grade said, "I love my VGo because I can drive it in circles plus I can flash a light and ask my teacher a question just like I am in school." Her mom, Evelyne said, "When Katrina was diagnosed besides being worried about her health, of course I was worried about her missing so much school. The VGo helps me be less worried and it helps Katrina keep up with school as much as possible from our home." Dr. Walter Rosenfeld, Chair of Pediatrics at Goryeb Children's Hospital said, "We strive to be part of a Trusted Network of Caring by not only having the top doctors and teams of clinicians, but also providing the support for children and their families that result in the best outcomes and patient experience. The VGo robot is another tool that helps us to allow kid to feel more like kids and we thank The Valerie Fund for helping to make this possible."